What happens before and after the camera shutter is released! Read the stories, techniques and image workflow. Two sayings speak to this shot. First, the one about a picture can’t do a scene justice. Standing there in the driving hail, witnessing multiple lightning bolts was quite the experience, but as hard as I tried I could not capture one bolt. The main part of the storm cleared right at sunset, so I was disappointed by the lack of color in the sky; however I was happy to come away with one shot from this quick but memorable trip. My decision to shoot at Lake Tahoe was based purely on the storm in the forecast, and the chance of it clearing at sunset. This brings me to the second saying that came to mind. Be careful what you wish for…Yea, right! 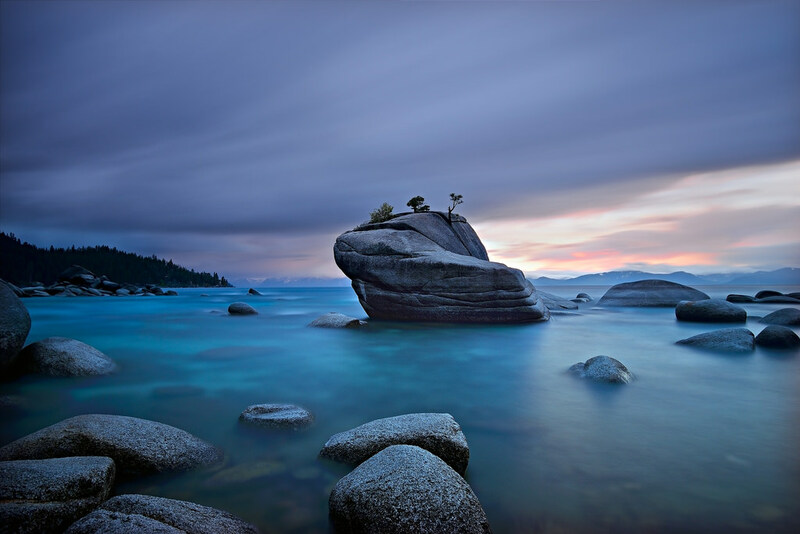 This entry was posted in Adventure Story, Photography, Travel and tagged adventure, beach, blue, bonsai rock, clouds, color, david shield photography, eastern sierras, grey, lake tahoe, light, long exposure, nevada, sky, storm on May 15, 2015 by davidshieldphotography.